A market without volatility would be unnatural, like an ocean without waves. The free market, like the open ocean, is constantly churning. For some investors, market moving waves can be exciting, but for most investors who focus on their long-term financial goals, the waves in the market can feel violent and threatening. While all volatility feels uncomfortable in the near-term, the important question for long-term investors is how to respond to it. We are in the later-stages of a long economic expansion. While above-trend growth is expected through the first half of 2019, it is important to acknowledge that volatility tends to be elevated in the second half of the business cycle. The cyclical nature of volatility can be compared to the ocean tide. Volatility ebbs with the positive and steadfast economic news that characterizes the beginning of the business cycle, and it flows when the market is mired by slowing economic momentum and fears of recession. Skittish investors, skeptical of the prospects of economic growth are the main cause of the bigger waves at the end of the cycle. As the labor market continues to tighten, interest rates continue to rise, and the impacts of fiscal stimulus begin to fade in 2019, the risks of a 2020 recession increase. A combination of mixed corporate earnings, ongoing trade tensions and softer economic data in 2018 have all weighed on sentiment. When there are fears of a recession, investors’ “edge of seat” mentality causes quick and sometimes irrational decision-making, and the subsequent herd behavior can amplify the market drawdown and ultimately cause tsunami-magnitude volatility. 1. Remember that volatility is normal. Volatility in the market is normal, and feeling uneasy about a lower portfolio value is normal too. Illustrating how often moderate pullbacks are experienced is simple enough, as Exhibit 2 shows. Even in years with outstanding equity returns there are rolling waves of volatility in the market. Historical analysis shows that pullbacks of 5% have occurred about once a quarter, and pullbacks of 10% are likely to occur once a year. Large pullbacks greater than 20% tend to occur just once per market cycle. A savvy investor will recognize the high frequency of equity market volatility, and will look to the source of the volatility before making a quick reaction to it. 2. Don’t jump ship at the bottom. 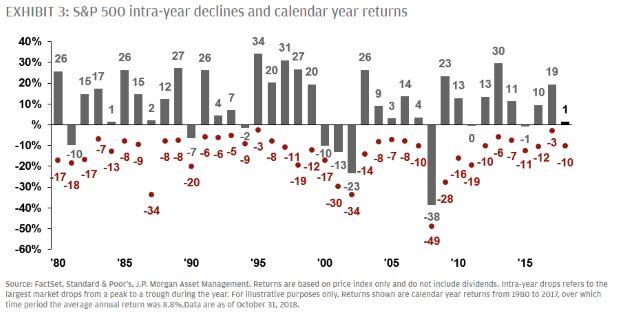 Exhibit 3 shows the largest intra-year decline and the calendar year return every year since 1980. Despite an average drop of 14.2%, the market ended the year higher than it began 76% of the time, demonstrating the importance of riding the wave through its full cycle. Being fully invested is especially important when there is market volatility, because the best and the worst days of the market tend to cluster together. Whilst it can be difficult to synthesise the portfolio impact of missing the best days in the market, missing these days has a real impact on investment performance. 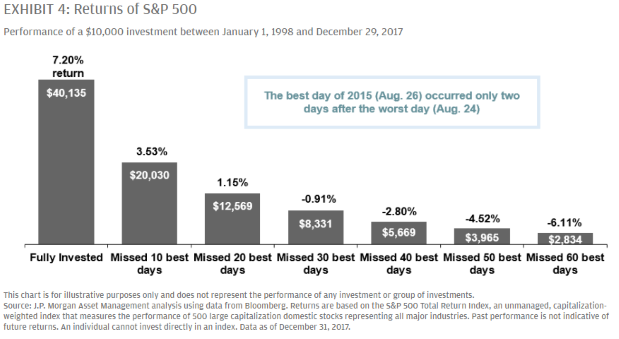 As Exhibit 4 shows, a fully invested portfolio would have returned nearly double one that missed the ten best days in the market. While big day-to-day market swings can feel violent, the reality is that they are not all that uncommon. 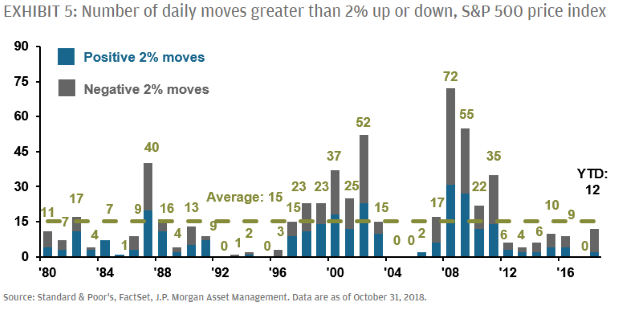 Since 1980, U.S. equities have averaged 15 days in which markets moved greater than 2% up or down, with years of above-average incidents tending to be clustered together. Interestingly, while days in which the markets are down 2% grab headlines, historically, on average there has been the same number of days in a given year where returns were greater than 2%. Large daily moves continue to be expected from time to time, and Investors are now debating the effects of higher interest rates, the direction of inflation, the impact of fiscal stimulus, mixed corporate earnings, the evolution of trade tensions and the timing of the next recession. This episodic volatility is expected to remain, however while the market may swing meaningfully from one day to the next, investors should be careful not to overreact to new information one way or the other. 4. Focus on the destination. While volatility can cause major deviations in the near-term for equity markets, investors should focus on their destination. Examining rolling returns for equities shows that historic annual returns have varied from -39% to +47%, while rolling annualized returns over a 20-year period are always positive. 5. Your portfolio was built for this. We live in a headline-driven world, where media often impacts equity prices in the near term, but it is possible to gain portfolio stability through diversification. While equities tend to perform better with economic growth and moderate levels of inflation, rate-sensitive fixed income is important when economic growth falters. The combination of various asset classes may improve portfolio returns, but diversification most importantly keeps your portfolio on an even keel. Though it is impossible to predict the future, expecting market volatility in the coming years is a safe bet. Just as the last 20 years have favored the diversified investor, it is expected that the next 20 will do the same. 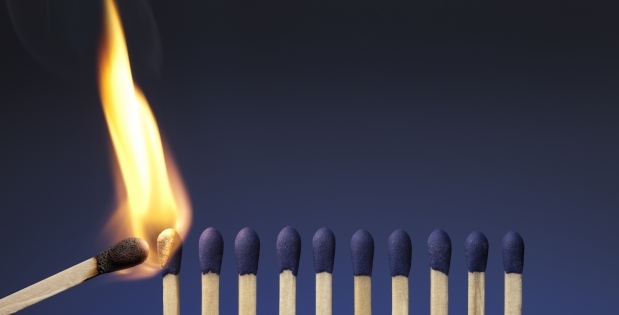 Investors need risk assets to reach long-term investment goals, and staying invested throughout that time horizon can be an investors’ biggest challenge. 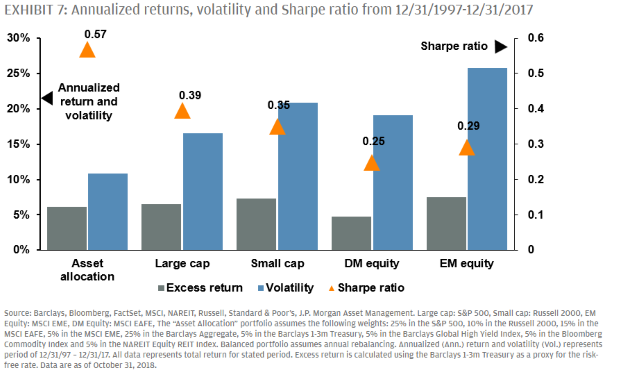 History shows that diversification and rebalancing are the best tools for reducing volatility and providing a gentler ride through sometimes difficult seas.